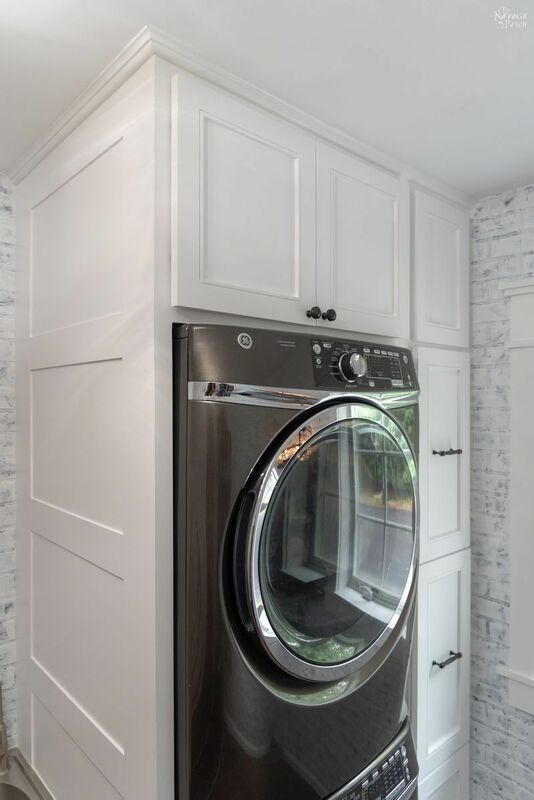 We built a custom Laundry Room Cabinet with pull-out shelves and cabinet doors provided by CabinetNow for our Laundry Room Renovation project! 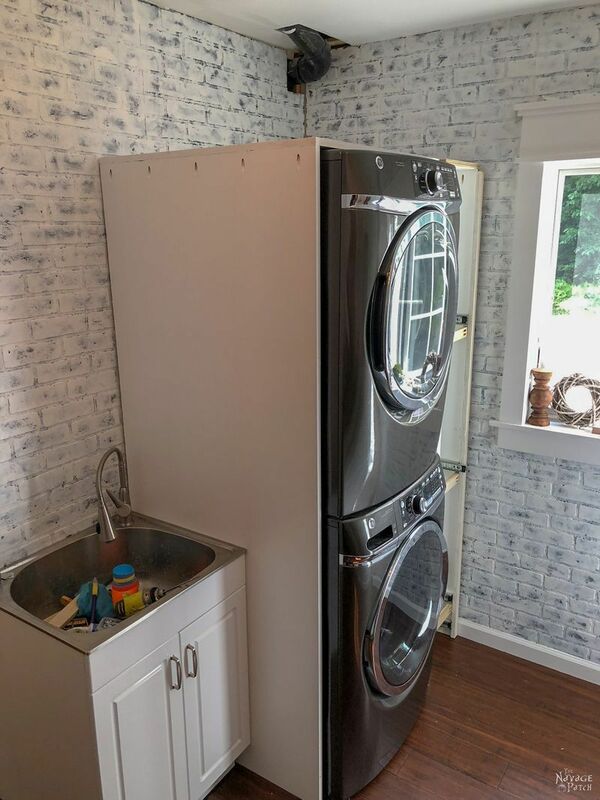 Handan and I hatched our zany plan to renovate the laundry room back in the beginning of April, and less than two weeks later, I received an email from CabinetNow saying they’d like to sponsor a post by providing us with free cabinet doors if I had any upcoming cabinetry projects. 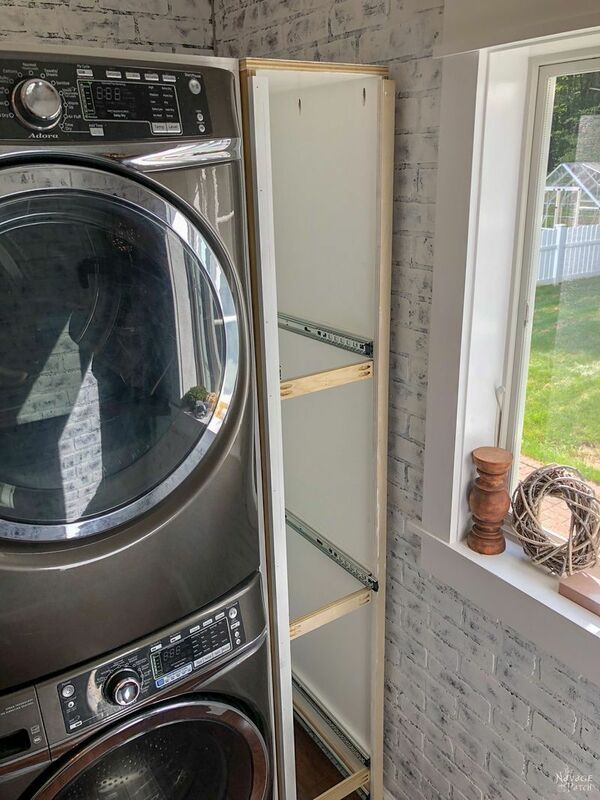 I had the mother of all custom cabinetry projects planned – a totally custom laundry room cabinet with pull-out shelves! I jumped at the chance to have the burden of building doors taken from me. 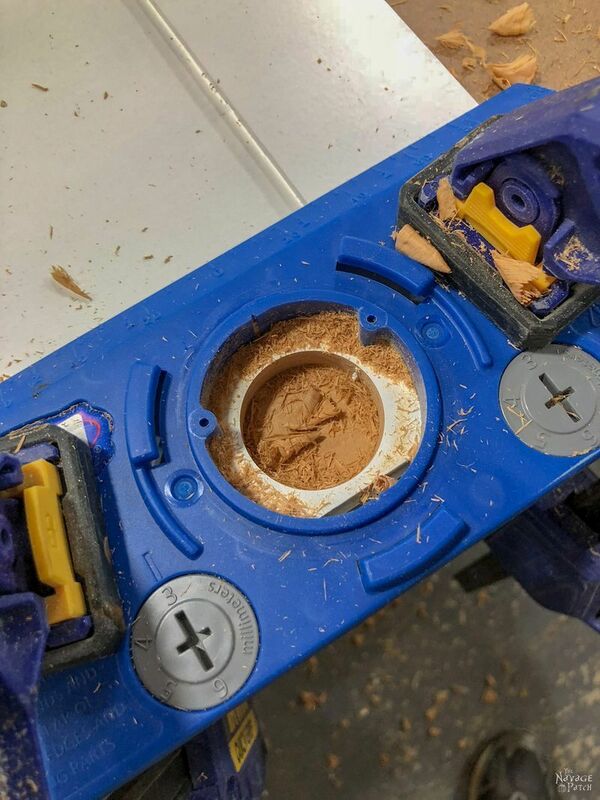 They may seem like the smallest and easiest part of a cabinet build, but believe me, cabinet doors are evil things that only trained nutjobs professionals like the ones over at CabinetNow should attempt to build. Okay, now that I’ve outlined the story for you (cabinet: me, cabinet doors: CabinetNow), let me take you through the past five months. Okay, okay! Maybe I didn’t work on them for five whole months. Maybe I procrastinated for four months and only really started working on them last month. Whatever! The small drawer on the bottom would hold two food bowls for our dogs. 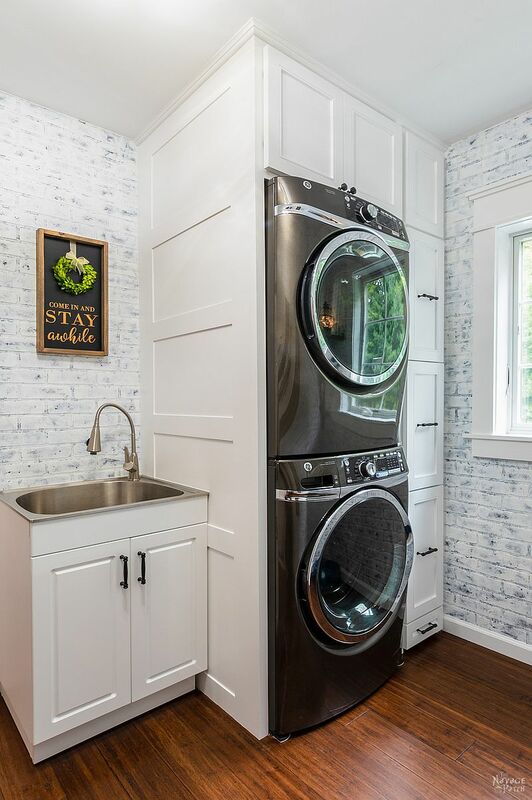 Those other doors to the right of the washer/dryer wouldn’t be doors at all, but really tall drawer faces. 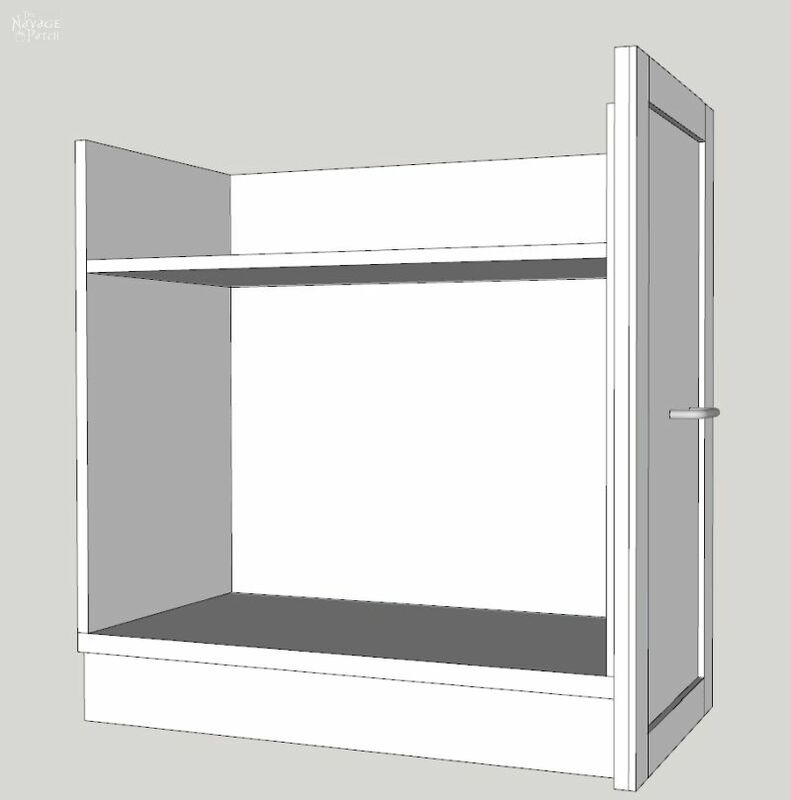 Handan wanted pull-out shelves for that cabinet. 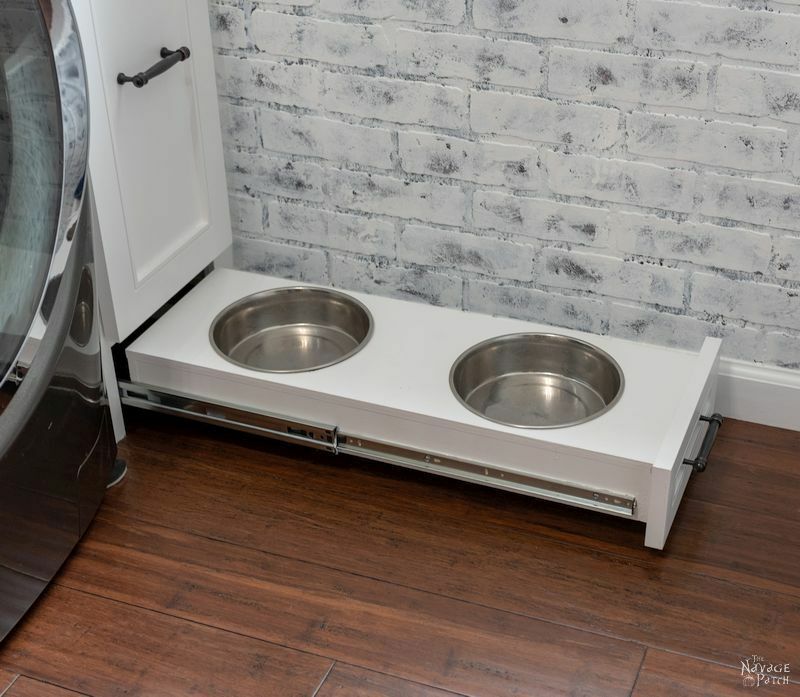 The drawer above the dog bowls would hold dog food. The drawer above that would hold laundry detergent and fabric softener, and the top drawer would hold whatever the heck we felt like filling it with (spoiler alert: dog bones). 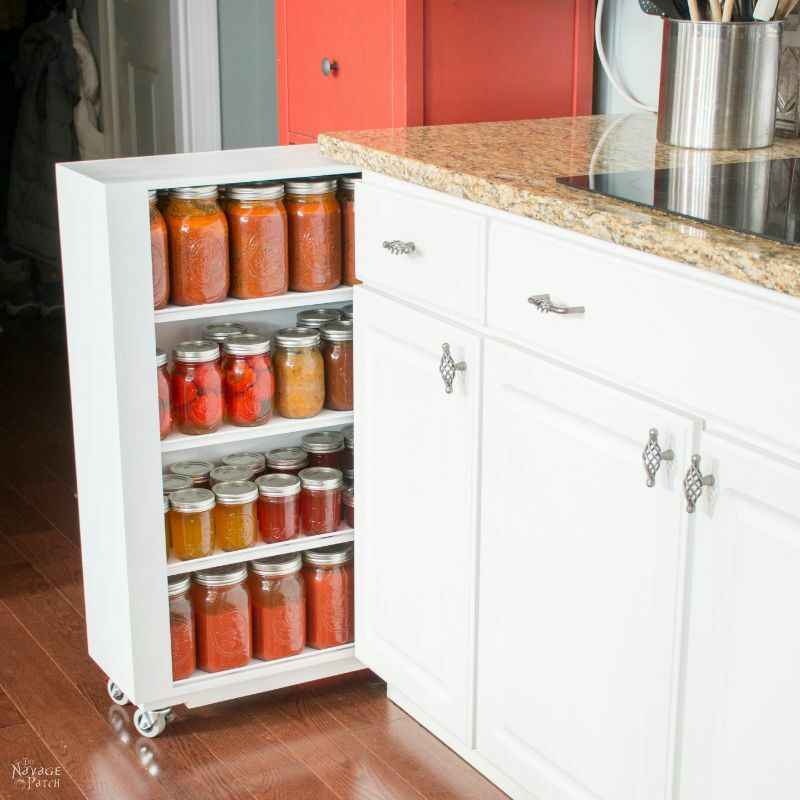 Essentially, it would be a Frankencabinet hybrid of the slide-out shelves I built for my kitchen cabinets and the rolling jar storage I built to hold my home canning jars. The top cabinet would have regular hinged cabinet doors that would open to reveal a big storage area. The upper right door would be decorative. 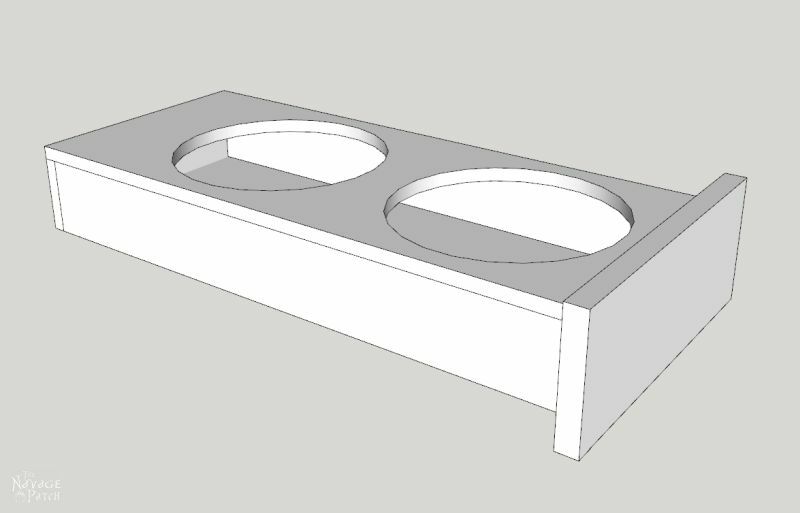 I do not have an engineer’s mind like Handan’s, and I am lousy at thinking in three dimensions, so there is no way I would have been able to tackle this project without Sketchup. It has served me well for all of my major builds – from bookcases to consoles to drawers to tables. 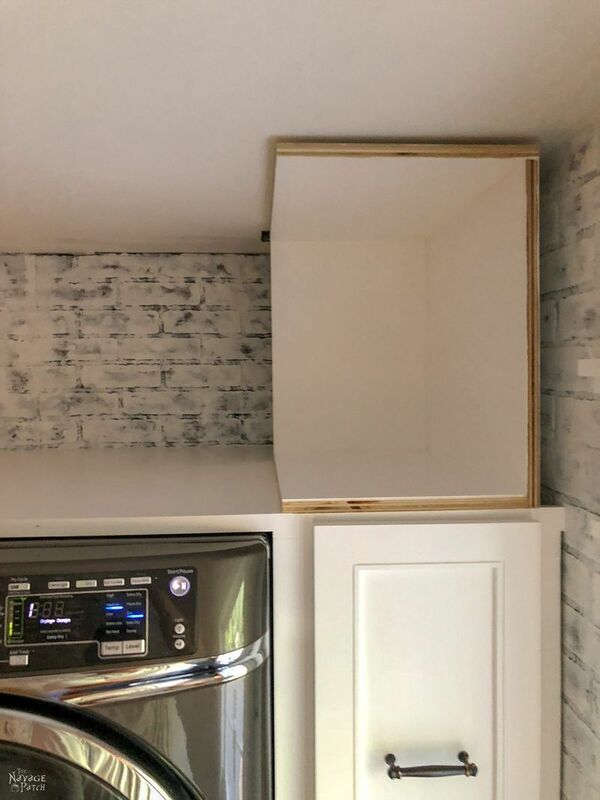 I planned to build and install the cabinet in three pieces: the washer/dryer enclosure, the side cabinet and the top cabinet. The hardest part of a project like this is starting the build. I designed it to be built mostly from 3/4 inch plywood, and those 4 x 8 foot sheets are heavy! I couldn’t do any of the initial cuts without Barish or Handan to help me manhandle those massive sheets onto some sawhorses for cutting. 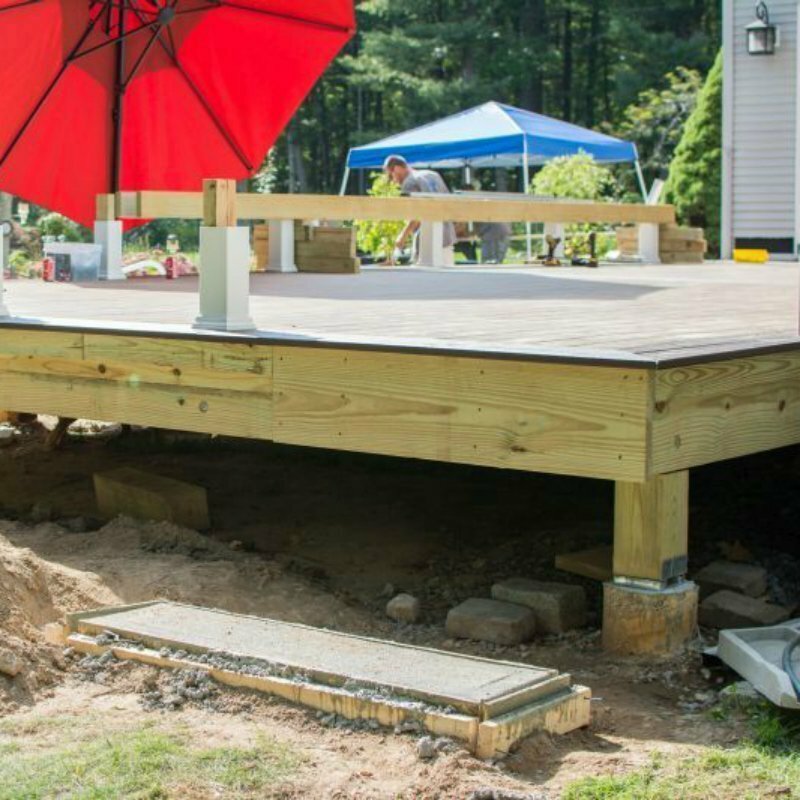 Once on the sawhorses, I marked my measurements and cut the sheets with a circular saw. When the pieces were small enough to handle, I cut them with my table saw. I cut all the pieces and then used my Kreg Jig for the pocket holes where needed. I started to assemble the drawer cabinet in the garage. And then Handan asked why I hadn’t painted it first. I couldn’t think of a good reason, so I took it apart, carried it back to the basement and painted all of the pieces. 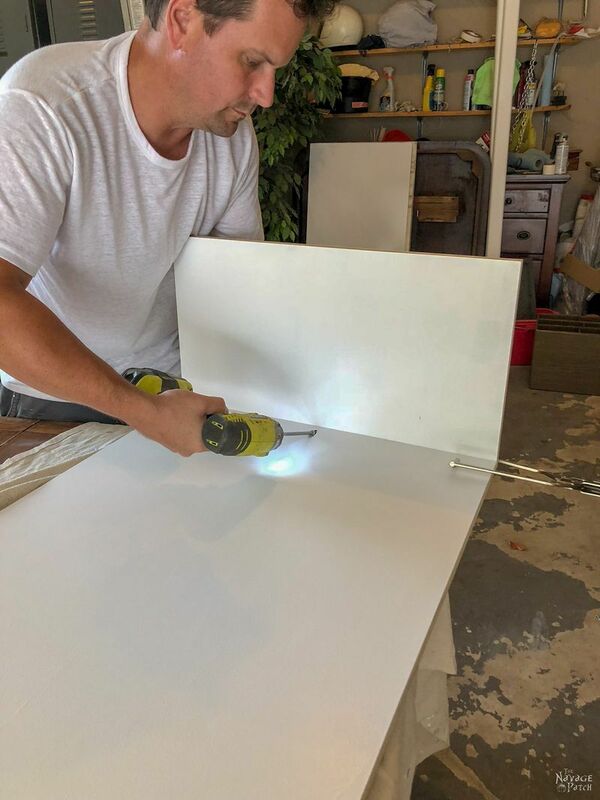 In the picture below, I’m using a microfiber roller to paint the cabinet pieces. Foam is a much better choice, and it is what I switched to after Handan pointed out that I’m a dummy and should have known better. 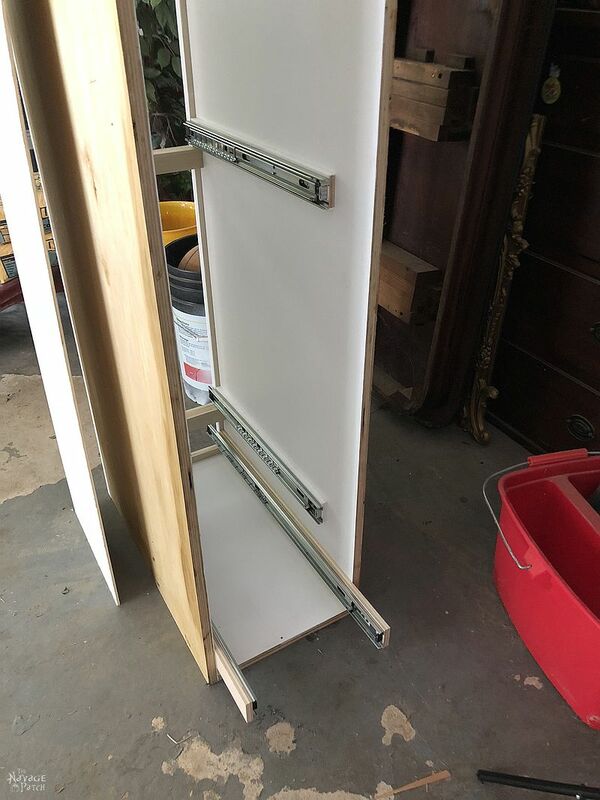 I had received the cabinet doors from CabinetNow about a month earlier, and they’d been sitting patiently in the garage, waiting for me to catch up with them. Since they would also be needing paint, I carried them inside. The doors were packaged exceptionally well. 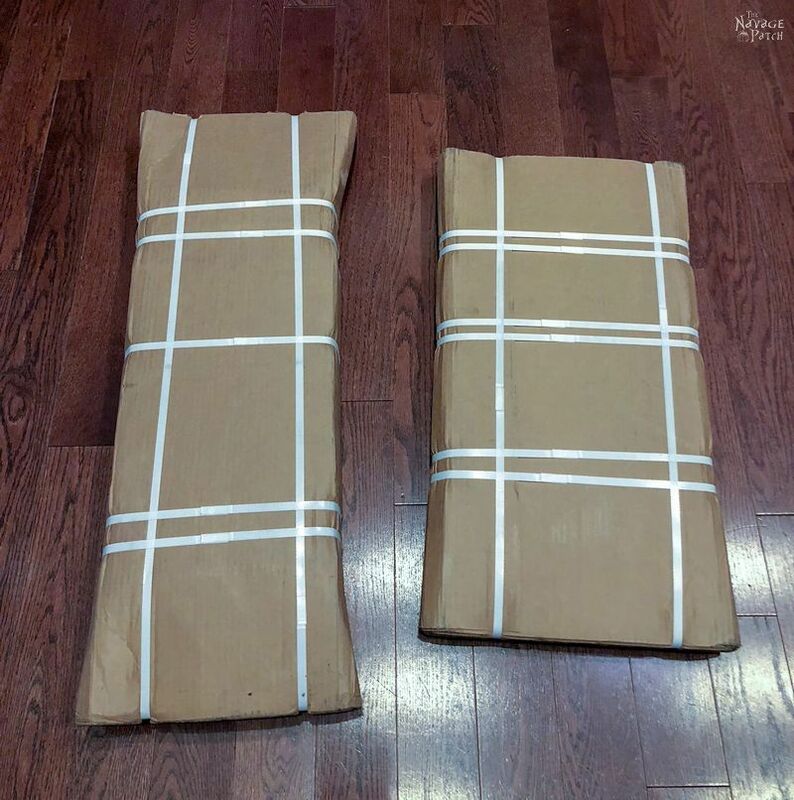 They were triple-wrapped in cardboard, so nothing was going to break through and ding them. 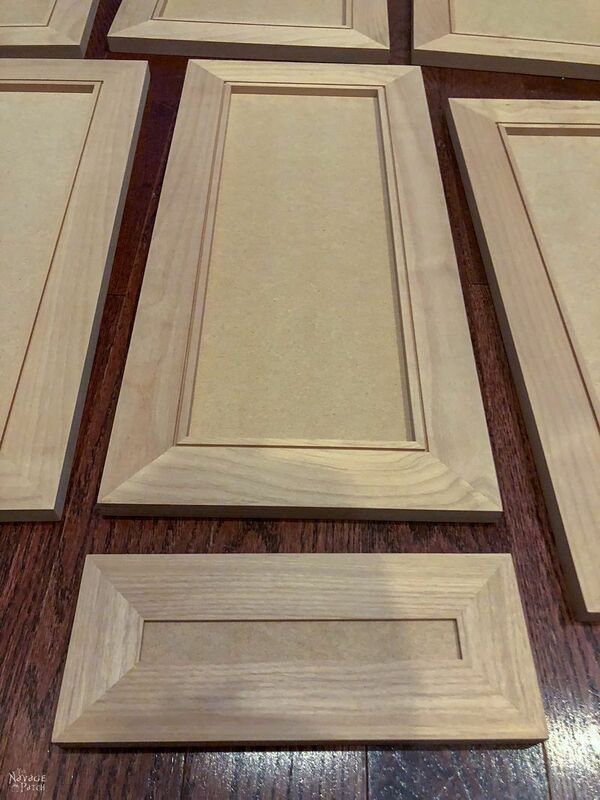 We chose one of the hundreds of styles on their website, and since I’d be painting them, I chose simple alder and MDF doors. 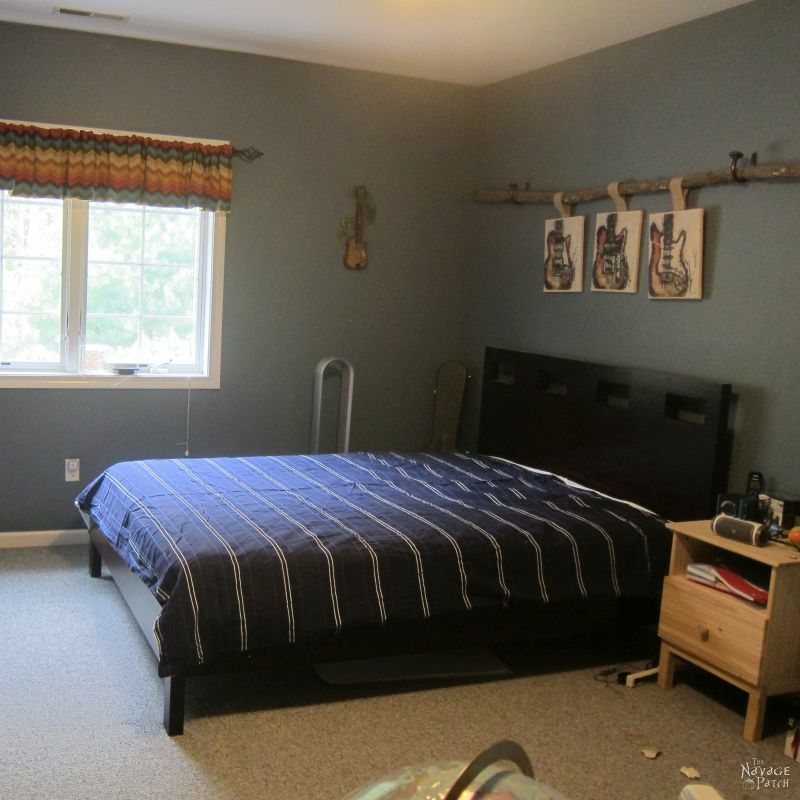 They have about 15 types of wood to choose from, all of them stain-grade except for paint-grade maple and the paint-grade alder that I ordered. No sense wasting CabinetNow’s money on fancy wood that I would be painting! 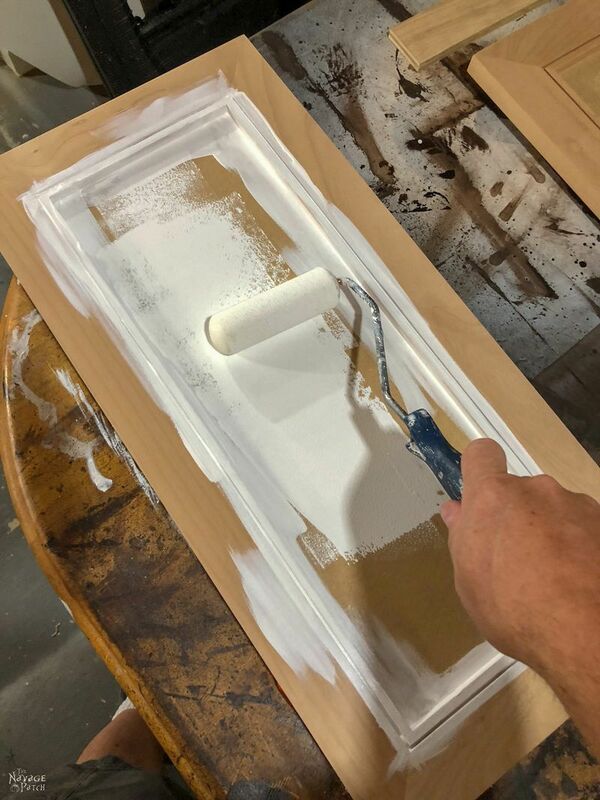 The doors were expertly built, perfectly sanded and ready for painting. 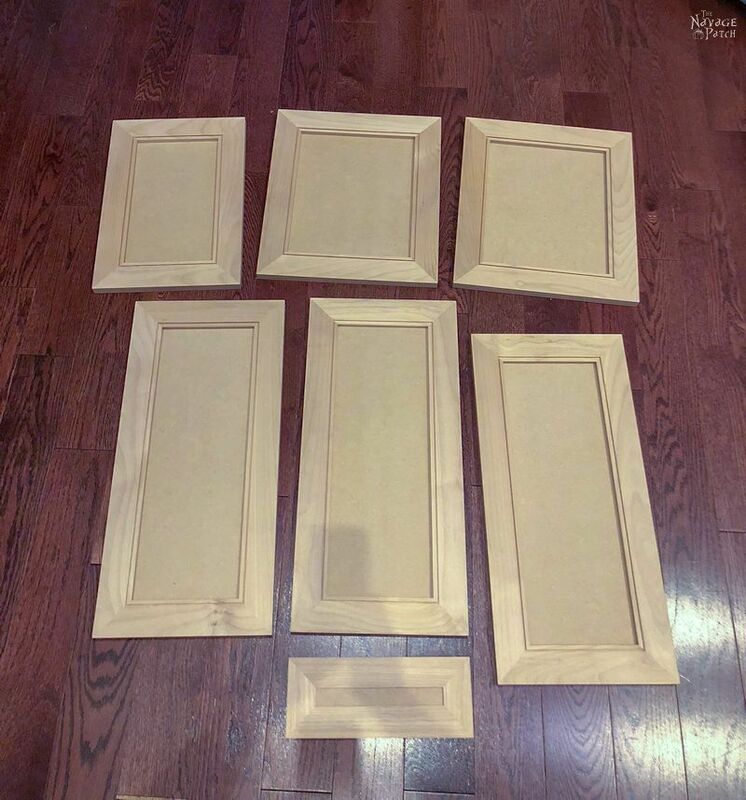 The fine folks over at CabinetNow asked if I would be needing cabinets to go with the doors. They have a full line of RTA (ready to assemble) cabinets. As tempting as that offer was, there was no way I would burden them with this custom-shop hell. 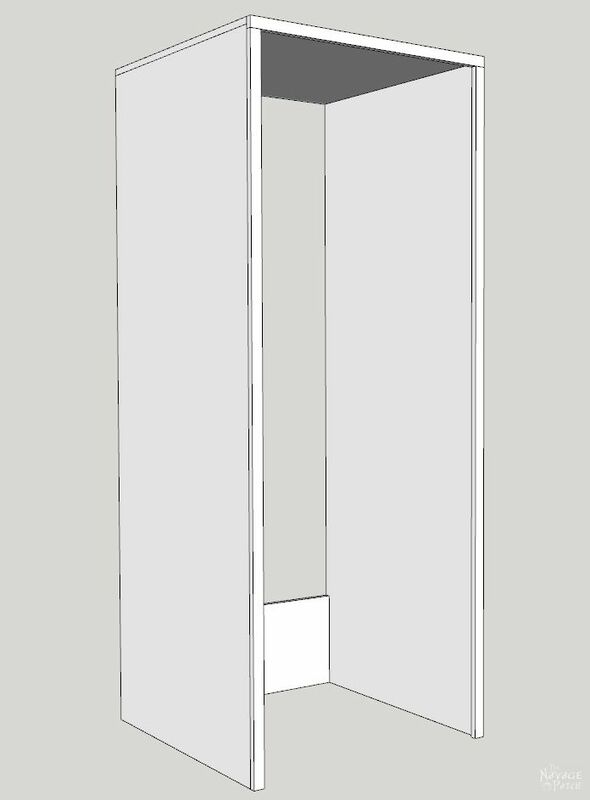 I had designed my cabinets with cutouts in the back to fit around pipes that were jutting out of the wall and ceiling. Plus, I wasn’t sure if I’d have to make some last-minute changes (I did – several, in fact), so I thought it best that I build the damn things myself. Oh, but if they offer to do our kitchen, I will bow down and worship at their feet! 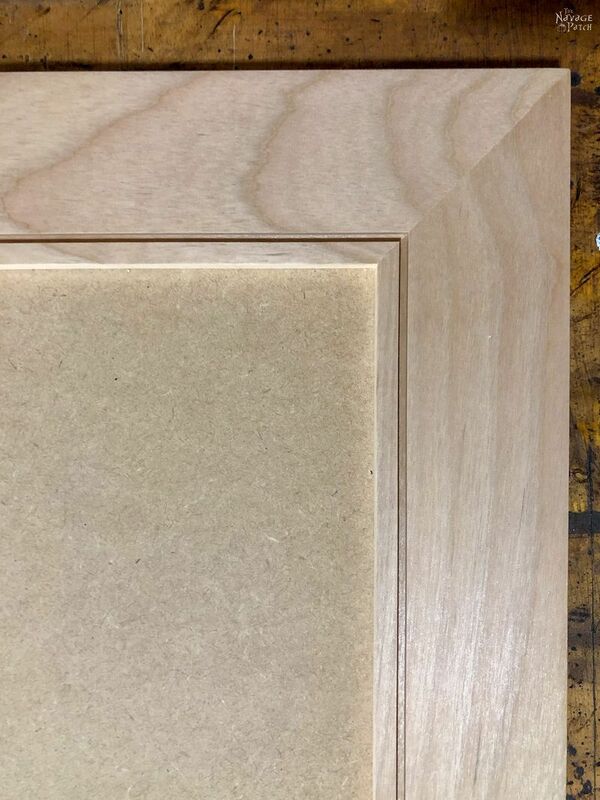 I thought of all the doors and frames I’d built over the years, and never – not once – have I ever assembled mitered corners so perfect. 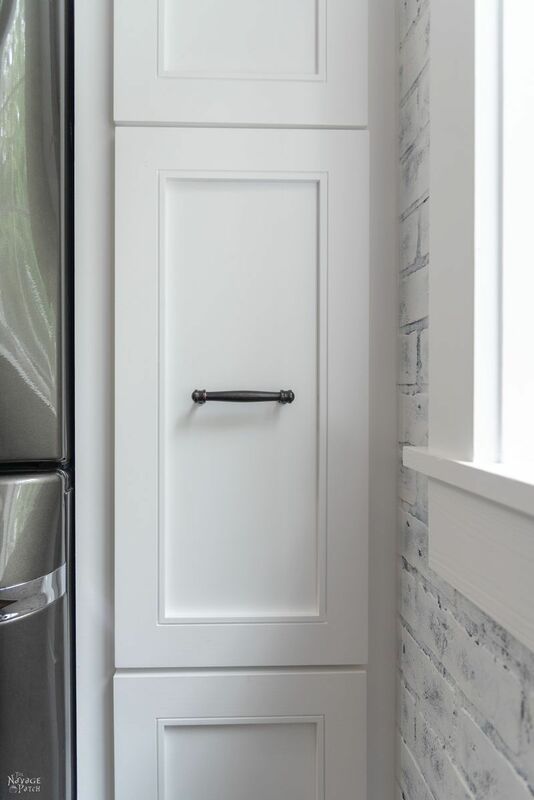 I painted the doors and cabinet components with three coats of Behr Marquee Ultra Pure White Enamel Paint in a satin finish. Handan also gave them a few more coats once they were installed. 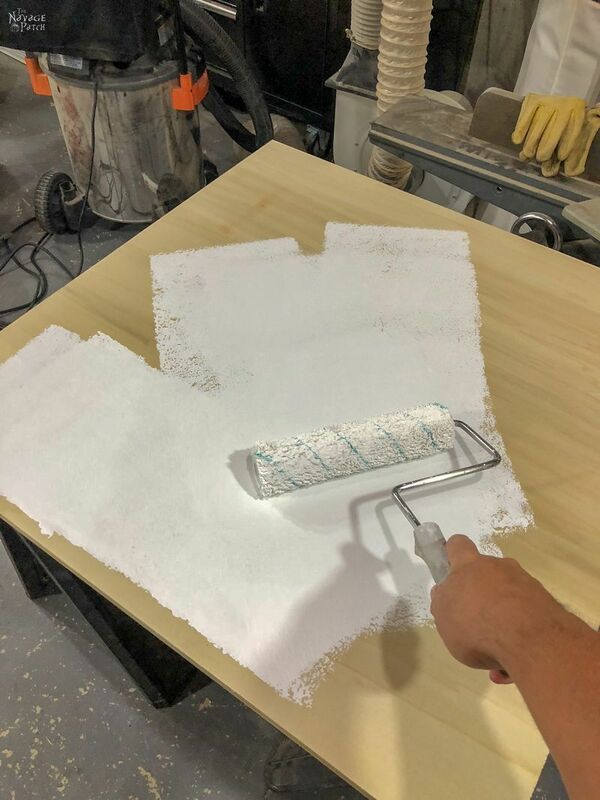 The best way to paint cabinets (besides with a sprayer) is with a foam roller. It gives a beautiful finish with no brush marks. I re-assembled the newly-painted cabinet in the garage. 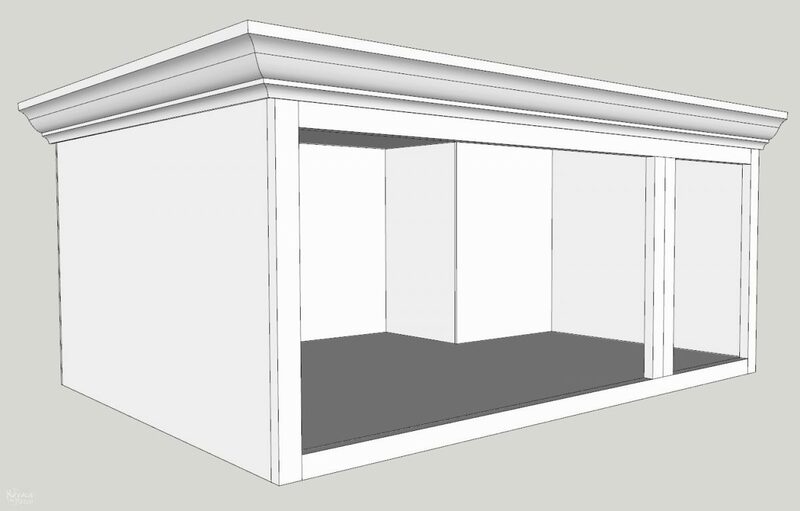 This was a wonky build, so it will be easier to see what I did by looking at the Sketchup plans. 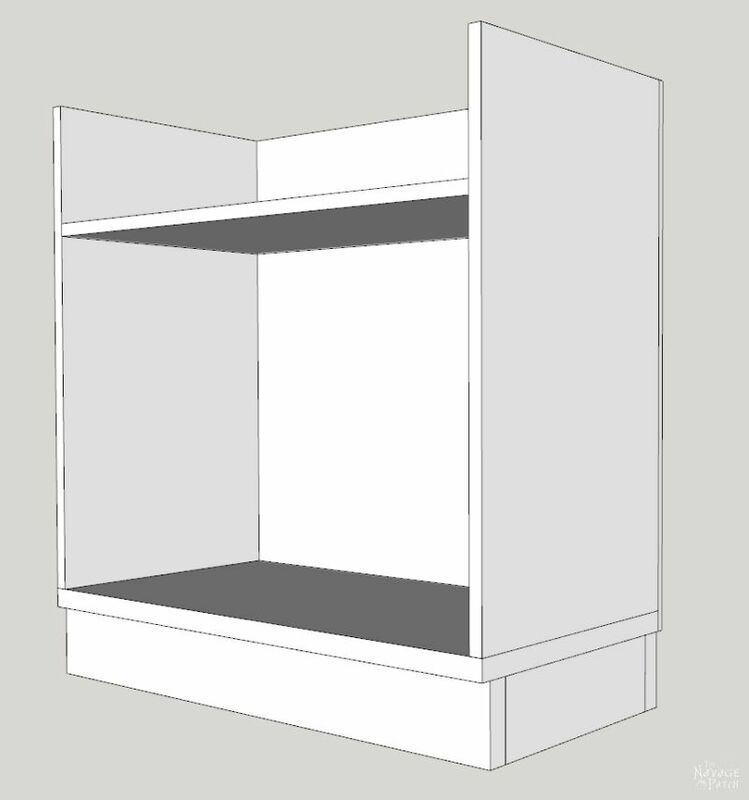 Here is how the side cabinet was built, before I put the drawers in or the back on. Once the side cabinet was built, I started building the dog bowl drawer and the other three shelves. Each one was unique and custom built for its purpose. 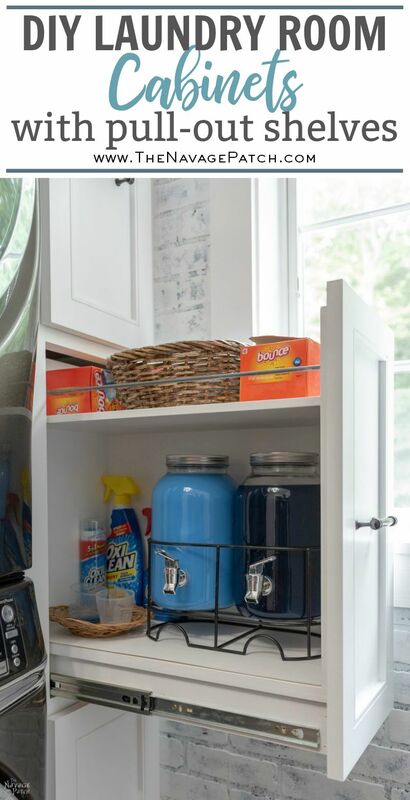 Here is the middle pull-out shelf that will hold laundry detergent and fabric softener. When the pull-out shelves were all built and put into place, Handan lined up the doors, and I hit each with some brad nails from the inside. I then further secured them with screws from the inside. 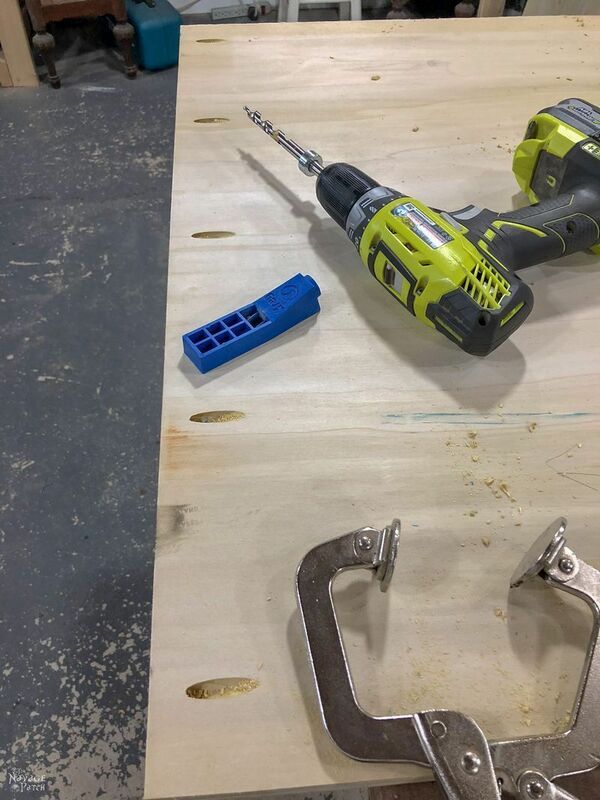 To make sure I installed the drawer pulls in the exact middle of each drawer, I built a jig from 1/4 inch plywood. With the pull-out shelves built and the doors attached, it was time to start putting the pieces in place. 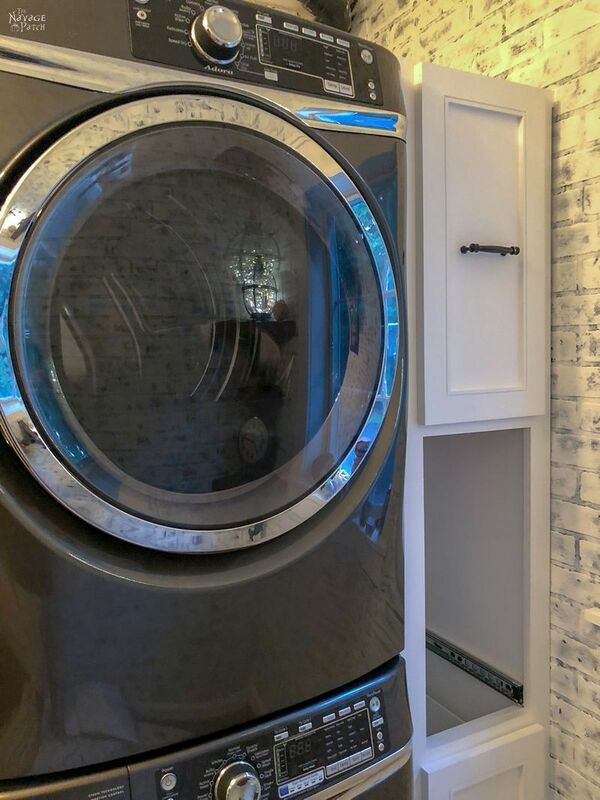 Before we could put the side cabinet in, we had to assemble the washer/dryer enclosure. It was simple – just two sides, a top, a support piece in back and a face frame. 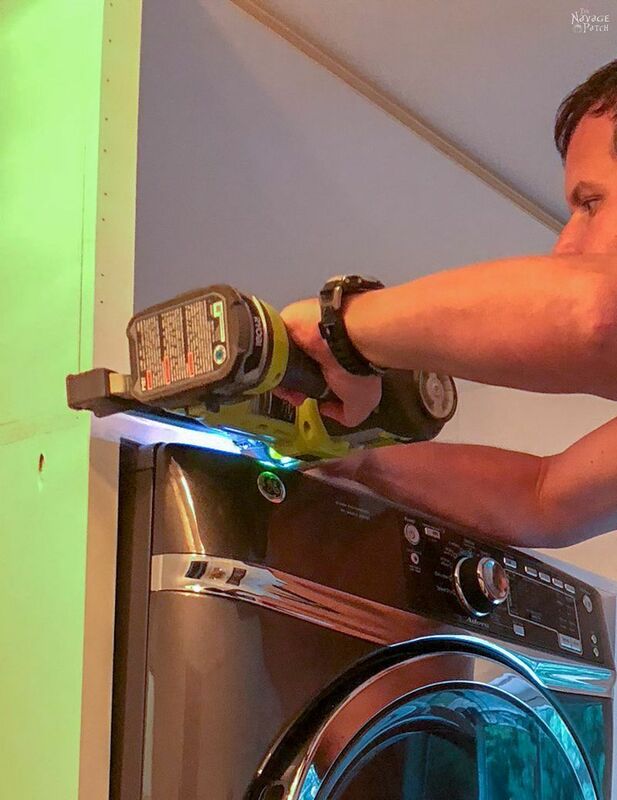 To build this in place, we had to slide the washer and dryer out, assemble the enclosure, and then push them all back in together, making sure the magnetic dryer vent hose clicked into place before we slid the enclosure completely back. Once the enclosure was in place, we slid the side cabinet in next to the enclosure. To keep everything secure, I screwed the side cabinet to the washer/dryer enclosure from inside the side cabinet. For the first time, I felt as if this project might actually finish. Until this point, I thought it would never end, and that is entirely due to my own procrastination. I had visions of lying on my death bed at the ripe old age of 482 with Handan by my side still bitching at me about not finishing these damn cabinets. You can see the pocket holes on the outside of the enclosure instead of inside. This is not a mistake. Just in case we ever need to get back there for some reason or another, I can remove the 1/4 inch trim pieces (you’ll see those in later pictures), peel off some caulk and slide that panel out without having to disassemble the whole kit and caboodle. With the drawers installed, it was really shaping up. The cabinet doors look awesome! The final component was the top cabinet. Its rear far corner is cut out to accommodate a plumbing pipe coming from the upstairs bathroom that we weren’t able to re-route or completely cover. With this solution, it won’t ever be seen. 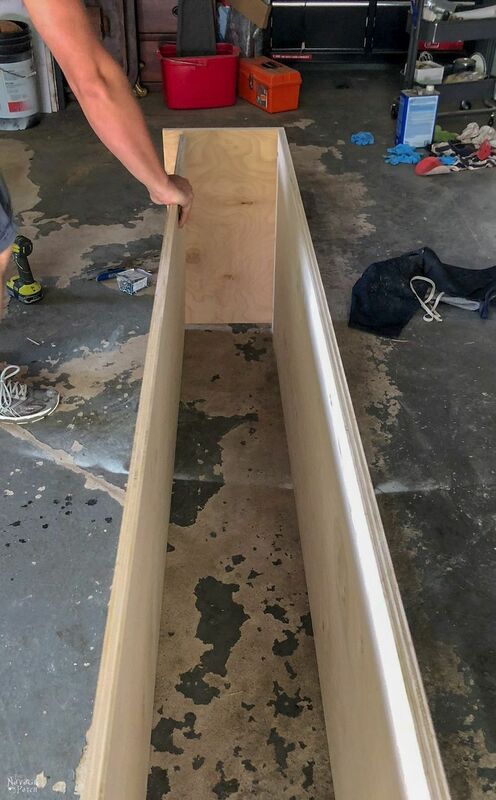 I started the assembly in the basement in two pieces, knowing it would be nearly impossible for us to lift and fit the entire cabinet in place as one piece, as there is only a fraction of in inch clearance between the top of the cabinet and the ceiling. The cabinet below is the larger of the two pieces. I installed the small cabinet piece myself. But I needed both Handan and Barish’s help for the big piece. Once it was up there, I attached the face frame with brad nails. I didn’t use any glue, just in case I ever need to take it apart. With all the major pieces installed, I turned my attention to the remaining doors. 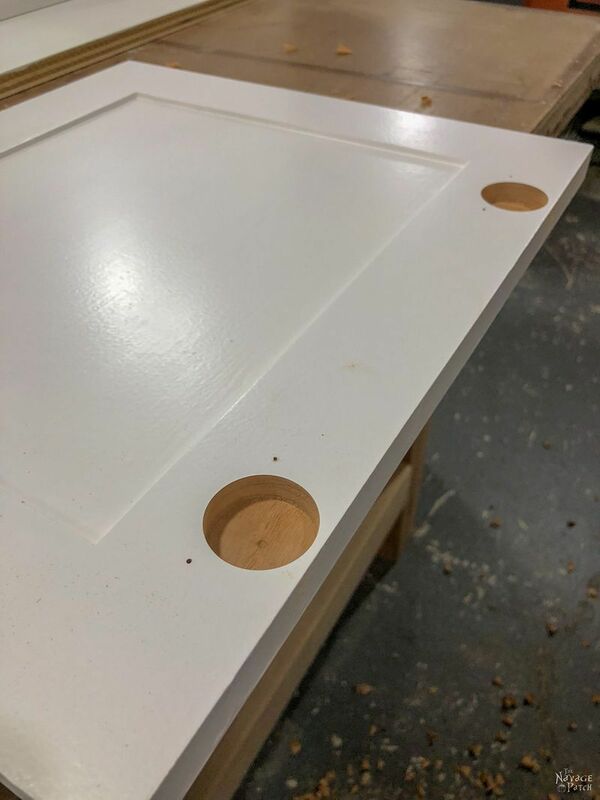 Since the top cabinet would have traditional swing-out doors, I needed to drill holes for the hinges. 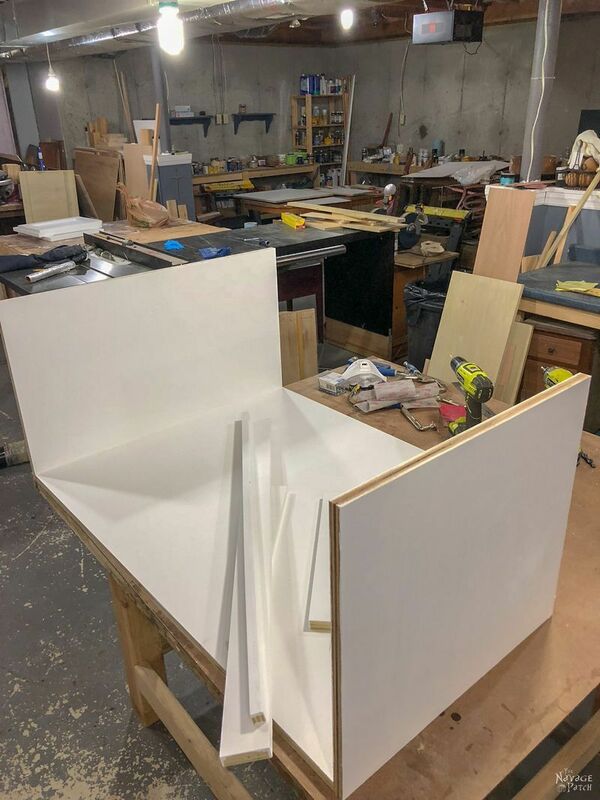 Now, I could have had CabinetNow drill the holes for me – that would have been the easiest route to take – but I wasn’t sure exactly how I’d be using the doors up top when I ordered them. I thought for a while that I would make those doors swing up instead of out. But the traditional way won out in the end. 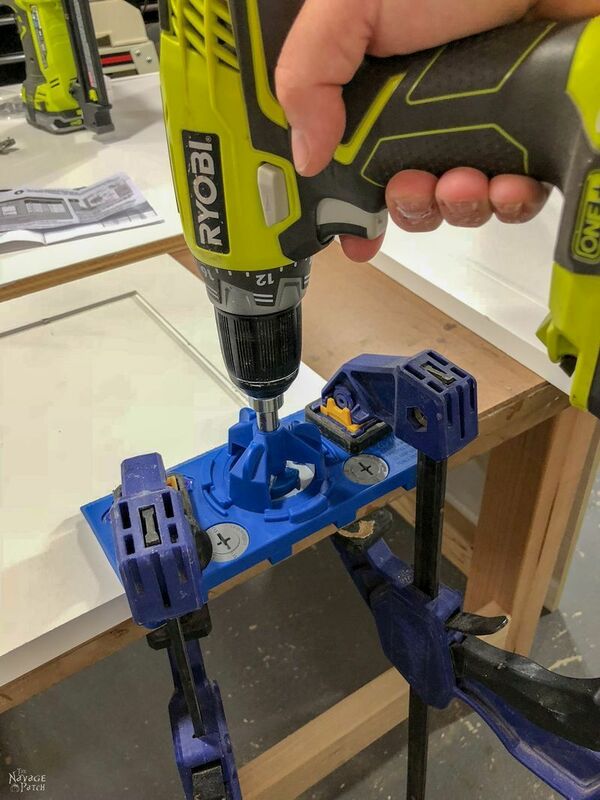 Drilling for cabinet hinges can be one of the most stressful parts of the job. I remember doing it freehand when I built my first cabinet. Yeesh, what a nerve-wracking job! I didn’t know then that there are jigs to help the process. 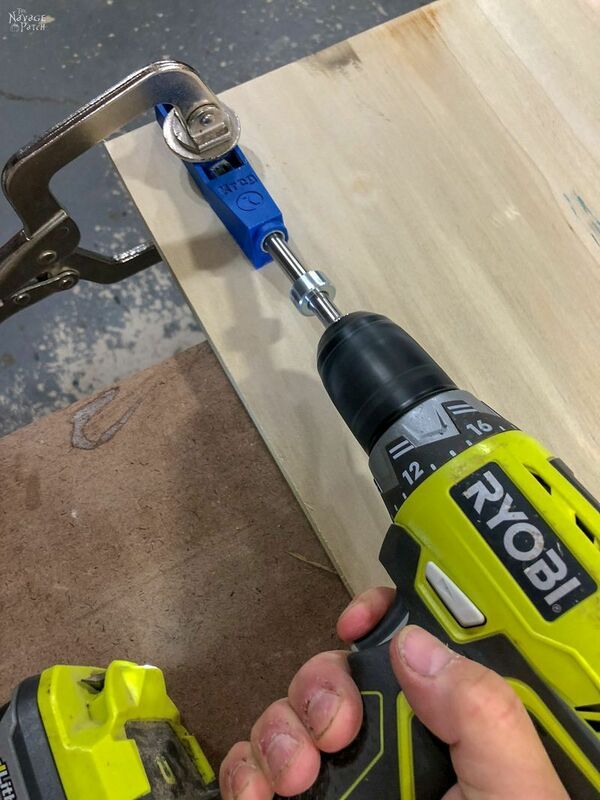 With Kreg’s hinge-mounting jig, drilling for hinges couldn’t be easier! Once the doors were installed, I put up the crown moulding. Since I only had less than two inches of room, I used the smallest moulding I could find. Handan gave everything another few coats of paint, and then we taped off all the edges that met with the walls and ceiling and ran caulk around the entire cabinet. While I was caulking, I felt a slight disturbance – a breeze on the small of my back. 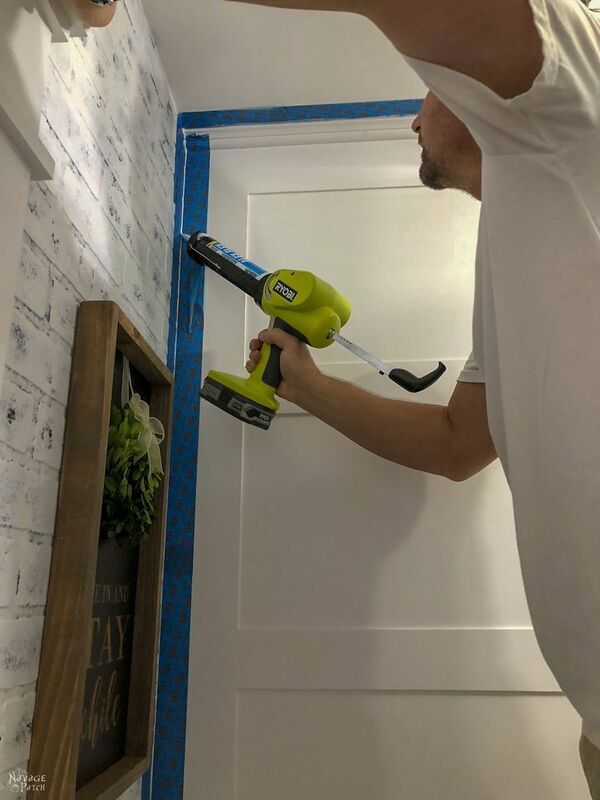 I was too busy concentrating on my caulk line to notice, but as I was gathering the photos for this post, I came across this shot. 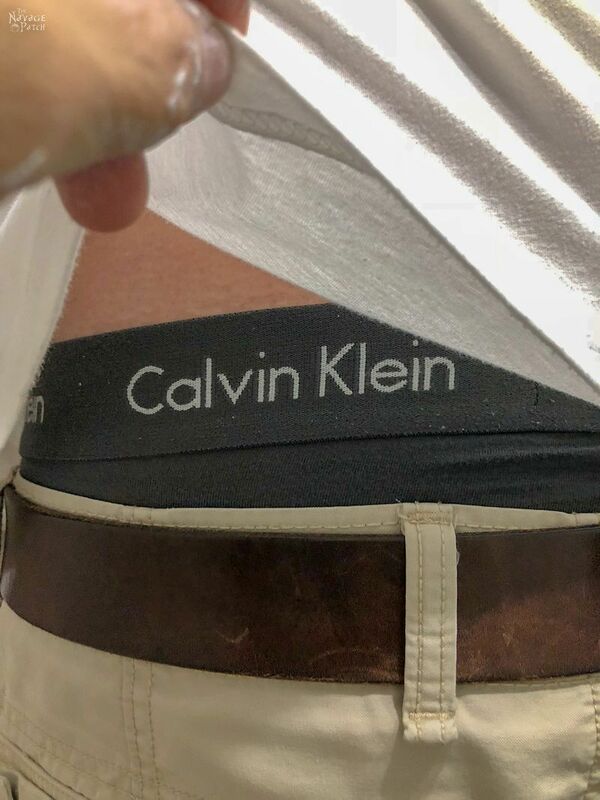 As I was toiling away, Handan was snapping candids of my Calvins. AGAIN! That woman is obsessed. 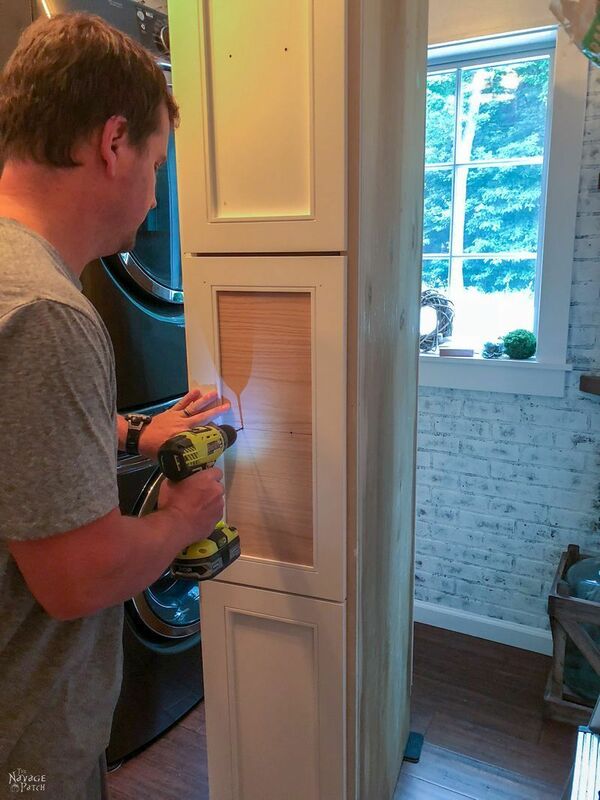 Calvin and I finished the caulking, and our new laundry room cabinet with pull-out shelves was done! Can you believe it? I’m not sure I can. It still seems like a dream. But every time Handan walks into the room, her face lights up, and I know this particular dream has come true. 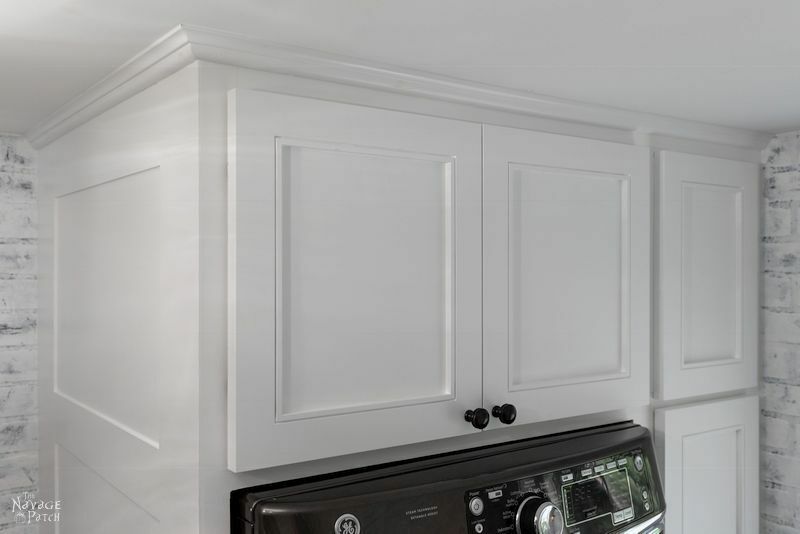 We can’t thank CabinetNow enough for supplying us with our cabinet doors! 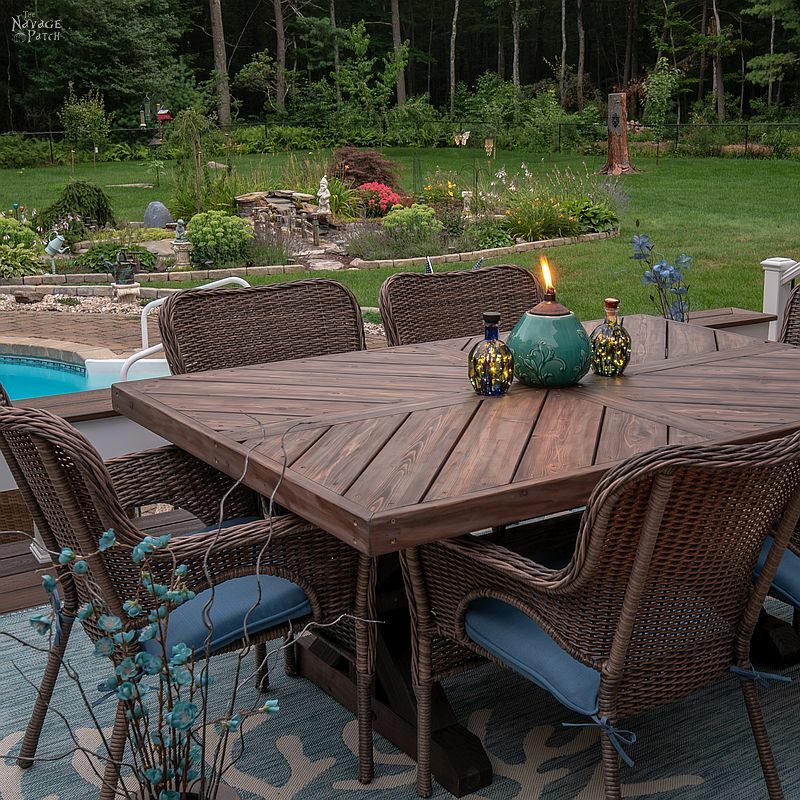 Before they got in touch with me, I hadn’t heard of them, but now I will not only be recommending them to anyone who cares to listen, but Handan and I will be using them in the future for our kitchen and master bathroom renovation. 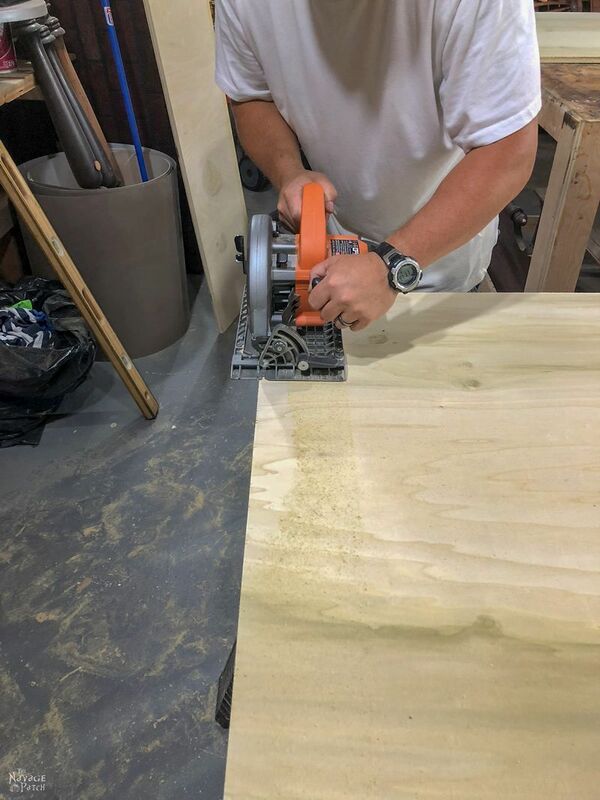 As I mentioned earlier, building cabinets (especially cabinet doors) is torturous work that is best left to trained professionals like the excellent (and probably a little nutty) folks at CabinetNow. 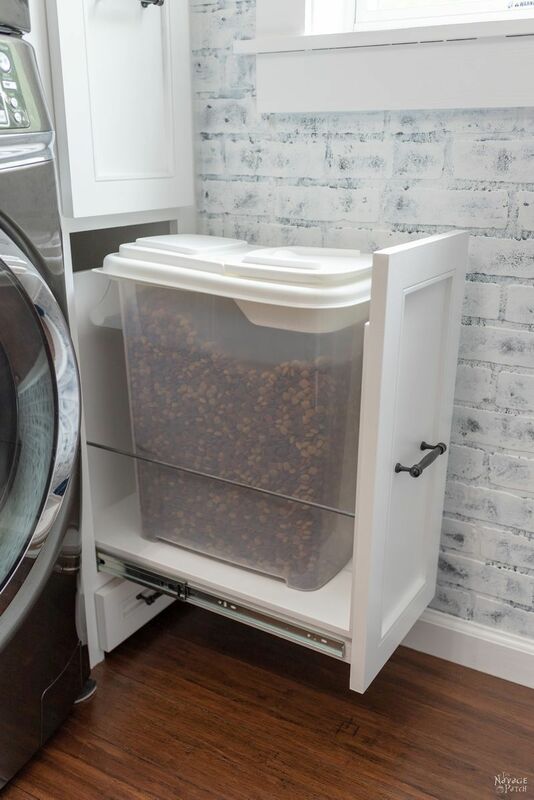 Moving up, we have the dog food storage bin. Next is the laundry drawer. 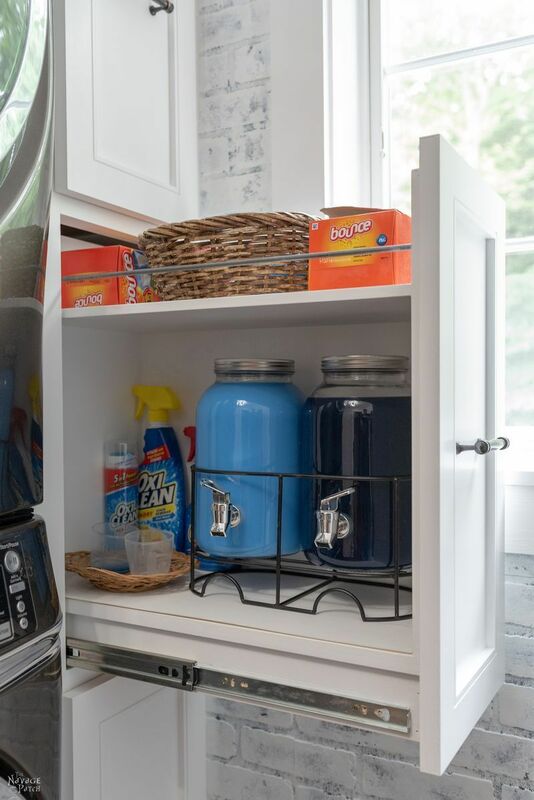 Handan bought a pair of mason jar drink dispensers for the detergent and fabric softener. 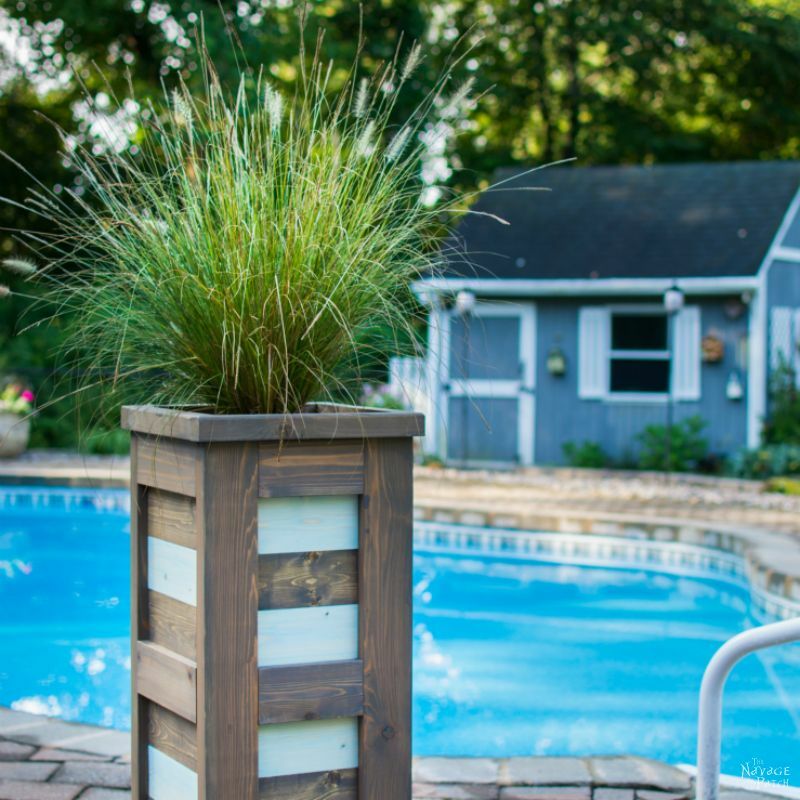 It’s a great way to save space, and it looks really cool, too! The top drawer also belongs to the dogs. Another shot of those beautiful doors from CabinetNow. 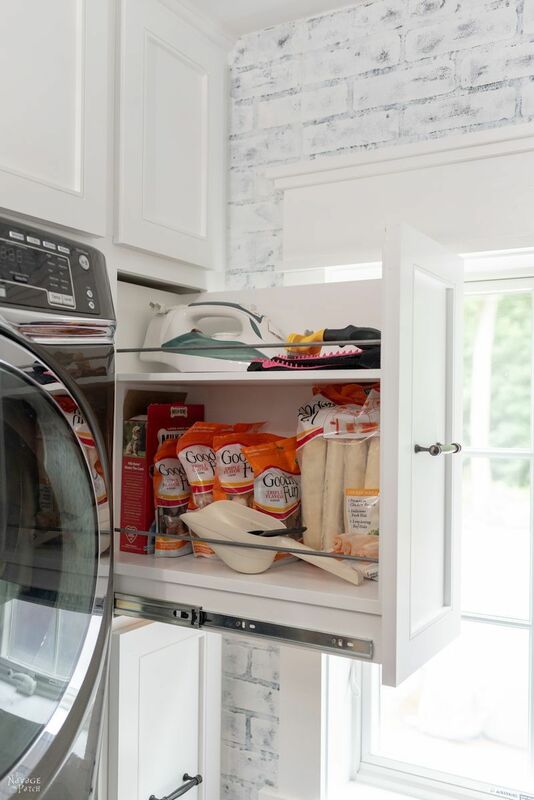 This cabinet with pull-out shelves was by far the hardest part of our laundry room renovation, but now that it’s done, it should be easy sailing until the end. We just have a few more little projects to complete, and then we’ll be ready for the big reveal in a couple of weeks. LOL, I’m not sure Handan would see it that way, Maigwen! The drink dispensers work really well! Fantastic design and execution! 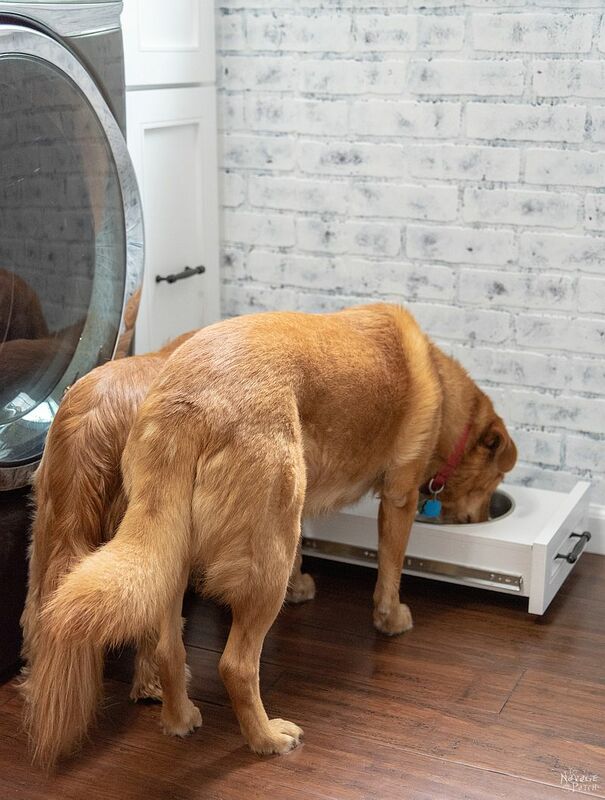 I love this – especially the storage for the dog food and those bowls!!! Such a great idea! 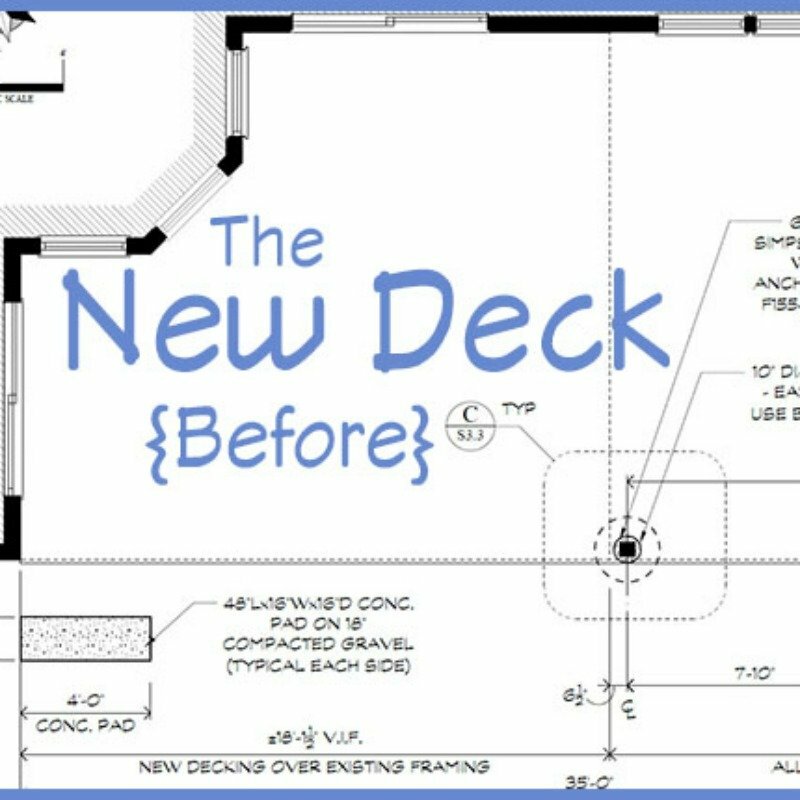 It’s great to be able to visualize the project with Sketchup; was it hard to learn? Hi Sara, thank you so much! 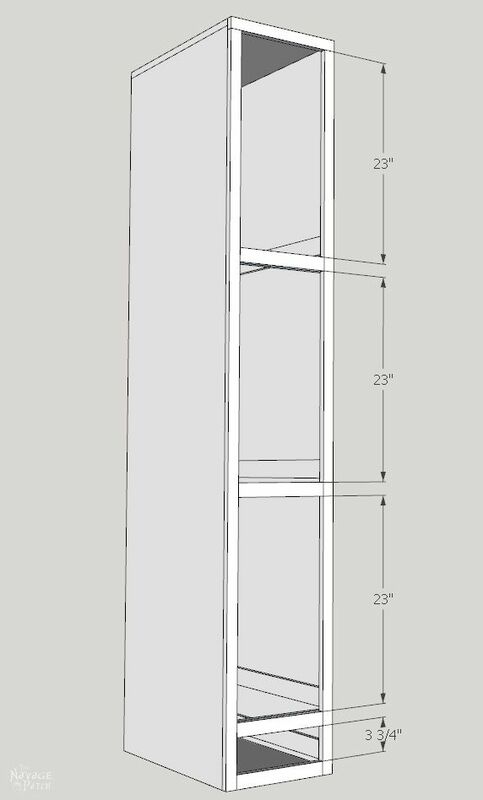 Sketchup wasn’t too hard to learn. I just watched a few YouTube videos and took it from there! Love, love, love the pull out drawer for the dog bowl!!! I suggested doing toe kick drawers; but was nixed on that!!! Thank you so much, Carrie! The dog bowls are awesome! Wow! My basement laundry room is so dingy (the previous owners just stapled plastic over the insulation!) so I hate going down there! 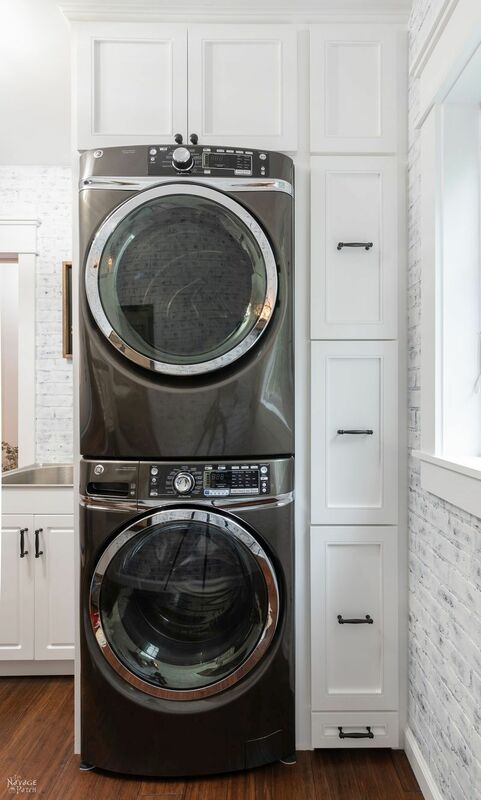 Your laundry room would almost make laundry fun, almost! The cabinet doors neaten up the whole project. Beautiful.! No wonder that laundry seems to be a never-ending task for most families. Trying to work while surrounded by towers of dirty clothes and countertops cluttered with laundry aides makes this massive chore even more unpleasant. 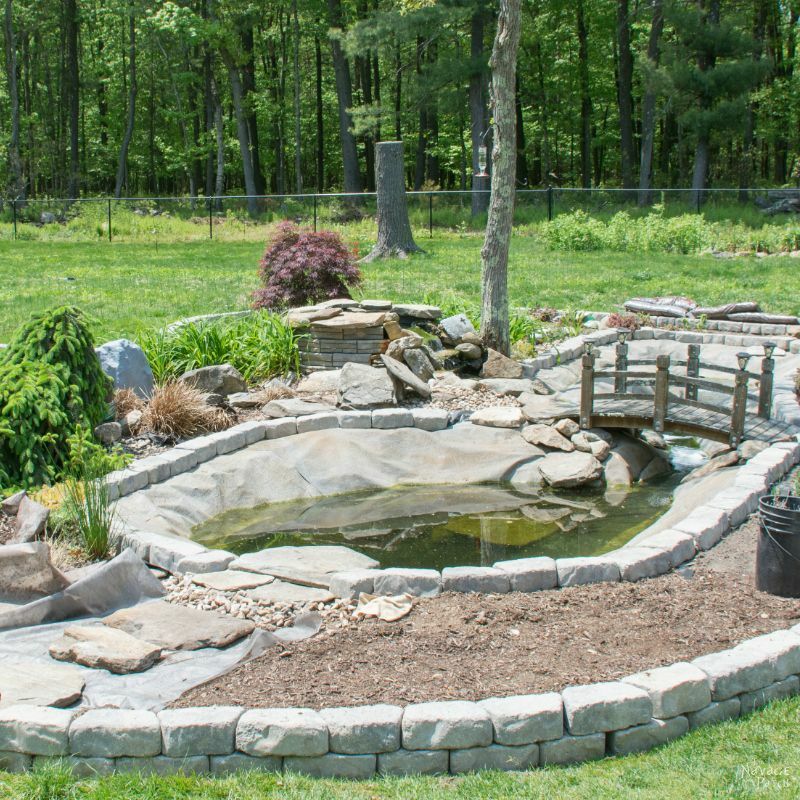 Saved your plans, for our make over next summer!